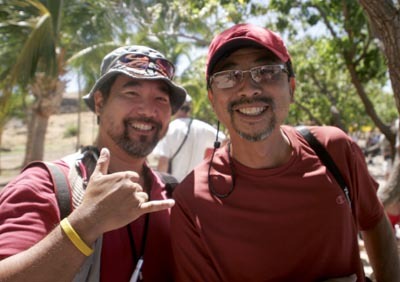 Me and Honolulu Advertiser photog Greg Y. at the cultural festival held at Puukohola Heiau National Historic Site. Greg won airline tickets in our AAJA silent auction so he shuttled the family over for the Saturday on his day off. 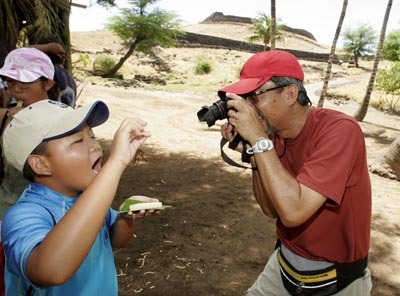 Here greg gets his son to eat an a`ama crab, or at least try to eat it. His kids thought the crab and coconut water (the water from inside a coconut) was kinda nasty. Kids these days aren’t used to the back to nature grub.